As is often the case, I received book free in exchange for a review. Despite that kindness I’m utterly candid below. First of all, spoiler alert. The heroes are spat out of a mysterious vortex, find and nearly defeat a mummy though rather mysterious and nonsensical plot points and then get sucked into another vortex. That about sums it up. To the positive, the author is wonderfully unfettered by the bounds of conventionality. Further, the illustrations are rich and colorful. I say illustrations, they appear to be photos cut out and arranged over each other to create the graphical components. To the negative, my 10-year-old daughter looked at it and refused to have anything to do with it. Given that the target age range is 8-18 this seems a pretty grim condemnation. If I had paid money for this I would be pretty annoyed. The plot is weak and essentially follows the same lines as a few hundred identical books including the previous two. The particular details of the plot are bizarrely confusing as the eggs travel without legs and obtain whatever items happen to be needed out of nowhere. I understand that it’s intended to be a children’s book but even children need connected series of events to make sense of the action. To sum up, my kids were EXTREMELY unimpressed. It’s obvious the authors have put a great deal of work into this book but it seems that the execution is almost rushed and never quite came together. First of all, spoiler alert. I’m going to tell you the whole story in this opening paragraph. Don’t worry, it won’t be long. A mysterious vortex opens and the eggs are laid. The eggs make their way to ‘Tree City’, gain weapons (which they haven’t any hands to use), kill a snake and arrive at Tree City. Then they are sucked into another mysterious vortex. The End. Well, it’s continued in the next book, of course. To the negative, my 10-year-old daughter looked at it and said, “whhhhhhaaaat?” and refused to have anything more to do with it. Given that the target age range is 8-18 this seems a pretty grim condemnation. If I had paid money for this I would be pretty annoyed. The story is nearly non-existent and what story there is makes little to no sense. Maybe this is supposed to be a farce of some sort but based on the description I don’t think so. Even if it is, it still won’t scrape this book off the bottom of the barrel. To sum up, my kids were EXTREMELY unimpressed. I’m personally failing to see what anyone else sees in it. Perhaps the next two books (which I have up next on my pile) will be more satisfying. This book just left me very glad I hadn’t paid anything for it. They dared Florence to enter the haunted house on top of the hill. She is frightened, but Florence musters the courage to go inside. As she makes her way up to the top she finds many ghastly things along the way. Will she make it back out or be turned into a stump forever? The Stumps of Flattop Hill is a macabre tale of a little girl who enters the town’s legendary haunted house in the face of fear. A dark tale for children in the tradition of the Brother’s Grimm, it calls to mind the provocative illustration style of Edward Gorey. Scary and entertaining, this book challenges the idea of what children’s books can be. As usual I received this book for free for the purposes of review; this time from the author directly. Despite this kindness I give my scrupulously honest opinion below. In a nutshell and quite obviously, this is a very brief and very simple book about snakes. The content is appropriate for any age but only the very youngest readers will find this worthwhile. Book formatting runs along pretty simple lines with a picture at the top of each page and a paragraph of text under it. On the positive side, the book is completely accessible. 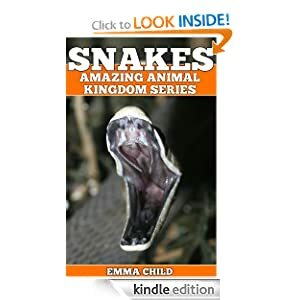 Even if your child has never seen a snake before in their lives this book will make sense. It assumes nothing about the potential reader and begins at the very beginning. To the negative side, the pictures in this book are pretty tiny. Even on an larger HD Kindle they’re hardly more than thumbnails. They look pretty high def but the way they’re laid out in the book you practically have to put your nose on the screen before you can see much. Lastly, the writing is reasonably professional though it does have a tendency to interrupt itself in the middle of a sentence “wait, what? !” which might be confusing to newer readers. In summary, this is a good little book to have around but it does have a few foibles. Despite that, you can’t beat the price this week while it’s free on Amazon. It’ll certainly keep at least one child entertained for a few minutes while you cook dinner. As usual, I paid nothing for this book but instead received a copy for review from NetGalley. Despite that kind consideration I give my candid thoughts below. 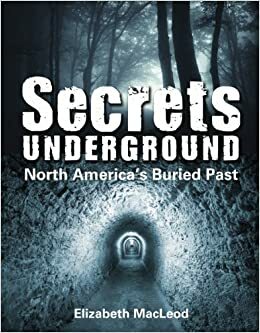 “Secrets Underground” is a very accessible yet detailed story of six different locations on the continent that have something buried underground. In some cases it’s actual open passages or rooms and in others it’s just remnants of some bygone era. The average section is about 15 pages long and features 12 photographs from half a page in size to thumbnails so this is about 70% text and 30% color photos. It’s primarily textual and probably appropriate for 10-12 year-olds. On the positive side, the author has chosen some very intriguing locales and it makes me want to travel more just reading a bit about them. Also, as I said the text is detailed enough to keep a young reader’s interest but very careful to define words that kids probably wouldn’t know. To the negative, many of the photos are rather small and some pages are decorated with abominable clip art of digging implements. The graphical layout seems rather unprofessional and at times distracting. In summary, the book lives up to its name and offers widely varied information on those mysterious bits lurking underground. It could use a bit more polish but it’s sufficient to keep kids interest. Visit our review on Amazon.com or Amazon.ca to let us know what you think and don’t forget to vote our review helpful if you find it so. If you don’t then that’s fine too but please let us know what we missed! 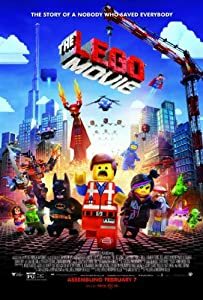 We saw this movie because my 8-year-old said, “Daddy, can we go see The Lego Movie? !” so away we went. So to the question of entertainment value, as I said in the subject line, the adults and kids both seemed highly entertained. We were in a full theatre and one gentleman in particular seemed to be outrageously entertained with his incontinent guffawing. The kids were, of course, entertained enough and the movie had humor working on all levels from the youngest kids to the adults, though nothing REALLY adult, if you get my drift. As to production quality of the movie, I was extremely impressed with the level of visual detail. I had assumed that since the Lego world is, of necessity, rather low resolution, that the movie might be clunky but they didn’t shy away from high-definition situations. Seeing Legos animated into an undulating ocean, explosions, fire or billowing smoke and dust was particularly surprising. In a similar vein, if you go see this movie be sure you keep an eye on the stuff going on in the background. I noted several scenes in which what was going on behind the focal point of the camera was at least as entertaining as what was going on in front. Lastly, on the topic of actually learning something, this movie was surprisingly deep. On the surface there was a profound lesson on the value of individuality vs working as a team. Often in children’s movies the themes crow constantly about being your own person and doing your own thing but this one has a strong streak teaching the value of working together and accomplishing more than any set of individuals working separately could. Later in the film, parents get a strong admonition about letting kids be kids and practice their individual creativity rather than trying to get kids to fit into strict parental expectations. All in all lot to learn here. In summary, Izzy said, “Best movie Ever!” but then she always says that. On my part I wouldn’t say best movie ever but it had a lot to say, was technically well executed and featured lots of famous voices that parents will recognize. I’m not sure what more you could want than that. Visit our review on Amazon.com or Amazon.co.uk to let us know what you think and don’t forget to vote our review helpful if you find it so. If you don’t then that’s fine too but please let us know what we missed!